Growing a lawn from seed has many advantages over sod. Grass seeds come in a wide variety of seed mixes so homeowners can select a seed well suited to their climate and needs. 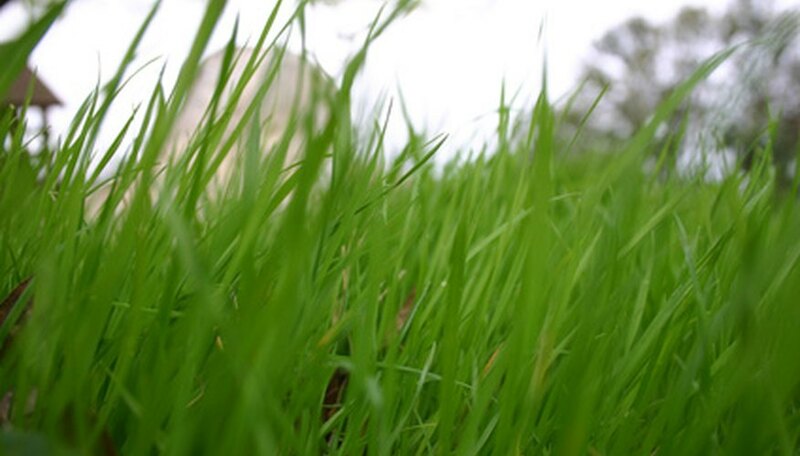 Grass seed is inexpensive and produces a thick, healthy lawn. Grass seed, however, requires patience and effort to grow and can take up to three months to germinate. A healthy lawn begins with good soil. Grass seed will germinate more quickly if all weeds and debris are removed from the soil before planting seed. Infertile soils should be amended with compost, manure or moistened peat moss. New construction sites often are devoid of the fertile topsoil, and bringing in additional soil is a good idea before establishing any plants. Fall is the best time to plant grass seed, according to Cornell University, rather than spring. In the fall, temperatures and moisture levels remain more predictable and weed growth declines or stops altogether. Young grass seed germinate quickly in cool, fall weather and become established before the heat of the following summer. Successful lawns start with good planting practices. Hundreds of varieties of grass seed exist and homeowners should select a variety that suits their climate, level of sun and natural moisture levels. Grass should be sown using a drop feeder according to the grass seed package directions. Overseeding grass will cause the lawn to grow too quickly and grass seeds will compete with each other. Lightly raking the grass into the soil or rolling it with a lawn roller helps the seed make contact with the soil, hastening germination. Keeping grass seed moist is vital for good germination. Grass seed needs watering several times per day during dry conditions to keep the soil moist at all times and prevent a crust from developing on the soil. The grass should be watered lightly so seed isn't washed away. Straw mulches applied to the soil help conserve moisture and keep the seed in place. A nitrogen-rich new lawn fertilizer can be applied two or three weeks after germination to encourage new growth. Grasses germinate and grow at varying rates, depending on the variety and conditions. Ryegrass germinates within seven to 21 days and grows quickly. Kentucky bluegrass can take up to three months to germinate. Fescues germinate within one to two months. Growth rates vary depending on the grass variety, as well as time of year. Grass grows quickly in the spring, requiring frequent mowing, but slows mid to late summer.